Are you ready? Time to make new friends, get in fights with old ones, and dodge all colors of shells again. Mario Kart 8 is out tomorrow, May 30, for the Wii U. According to a press release from Nintendo the game will be on store shelves and on the Wii U eShop for $59.99. To sweeten the deal, if you buy and register Mario Kart 8 by July 31 you get a download code for another Wii U game. North Americans can pick from New Super Mario Bros. U, Pikmin 3, The Legend of Zelda: The Wind Waker HD or Wii Party U.
REDMOND, Wash.–(BUSINESS WIRE)– 3 … 2 … 1 … GO! Whether playing with family members in the living room, fellow students in the dorm, coworkers in an office or even online with friends around the world, there is nothing that elicits the same fun, camaraderie and healthy competition like a rousing round of Mario Kart. 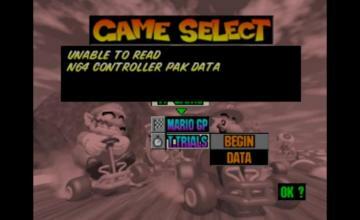 The Mario Kart series is one of the most recognizable and loved video game series of all time. 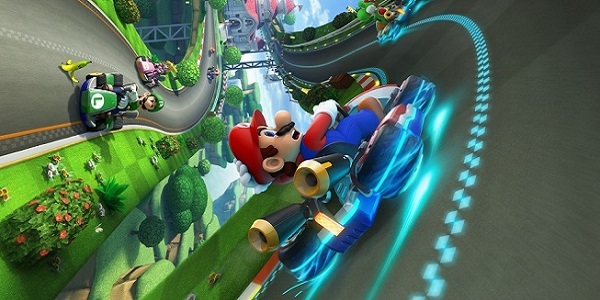 Tomorrow, Mario Kart 8 will race into stores nationwide and the Nintendo eShop on Wii U, bringing with it anti-gravity racing that finds players speeding upside down and along walls using karts and motorbikes, a variety of single- and multiplayer features and stunning high-definition graphics that make every detail pop off the screen. 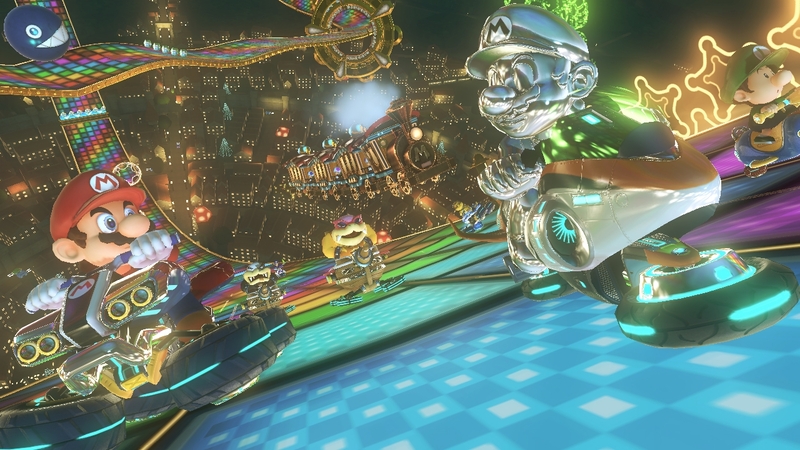 Mario Kart 8 introduces anti-gravity racing, allowing for some of the most creative and mind-blowing track design the series has ever seen. When players drive over a blue anti-gravity strip, the tires on their vehicles will turn sideways and emit a blue glow. When this happens, drivers can defy the laws of gravity by racing upside down, along walls and even up waterfalls. While in this mode, players can bump into each other to get a Spin Boost. This anti-gravity Spin Boost fundamentally redefines the way players compete and makes anti-gravity racing even more exhilarating. Up to 12 players can race or battle online, as long as everyone has the game and a broadband Internet connection. Players also can create public or private tournaments for which they specify the day of the week, the time and the rules. Per tradition, players will be able to race against ghost data from friends or even the top 10 worldwide racers. With the new Mario Kart TV feature, players can even watch their highlight reels, rewind them, play them in slow motion or post them to Miiverse (a Nintendo Network ID is required). Players with Google accounts can also upload their reels directly to their YouTube channels to show off their slick racing moves. Mention the Red Shell, Banana Peel or blue Spiny Shell items, and any fan will be able to instantly tell you what each one does in the Mario Kart series – they are that recognizable. All of these classic items return in Mario Kart 8, but are also joined by four new creations: The long-range Boomerang can be thrown up to three times, returning to its owner after each toss. The Piranha Plant attaches to the front of the player’s vehicle and not only provides a speed boost with every lunge, but also bites other drivers or items that come too close. The Crazy Eight gifts eight orbiting items to a lucky driver to be used one by one. And last but certainly not least is the Super Horn. This item sends nearby drivers flying with a powerful sound wave, but also can blow away any incoming items like the dreaded and powerful blue Spiny Shell. That’s right: The blue Spiny Shell has finally met its match. Mario Kart 8 will be available in stores and in the Nintendo eShop on Wii U on May 30 at a suggested retail price of $59.99. Also on May 30, a Mario Kart 8 Deluxe Set Wii U bundle hits retail stores, giving people who don’t yet own a Wii U system a very appealing and affordable way to hop into the driver’s seat. The bundle includes a 32 GB Wii U Deluxe Set system and GamePad controller, a Mario Kart 8 game disc, a Mario Wii Wheel accessory and Mario Wii Remote Plus controller, all at a suggested retail price of just $329.99. People who register the physical or digital version of Mario Kart 8 with Club Nintendo before July 31 will receive a free Nintendo eShop download code for an additional Wii U game at no cost. They can choose from one of these well-received Wii U games as part of the promotion: New Super Mario Bros. U, Pikmin 3, The Legend of Zelda: The Wind Waker HD or Wii Party U. Visit http://club2.nintendo.com/mario-kart8-promo for more information. Mario Kart 8 is now available for pre-order at major retailers throughout North America. A deposit may be required for pre-orders. See individual retailers for details. For more information about the game, visit http://mariokart8.nintendo.com/.